On the right side of the T43 you will find a security port for use with cable locks, two USB ports, an S-video output, gigabit ethernet, 56k modem, headphone output, microphone input, a Type I/II PCMCIA slot, and an ExpressCard/54 or 34 slot. All the basics covered, though those 2 USB ports are all you get, a little skimpy by todays standards. The back of the system is a little more austere. You get a rather retro parallel port (remember those?) and a place to plug the AC adapter in. The rest of the rear is taken up by the battery. The extended battery replaces the normal battery and sticks out about an inch. 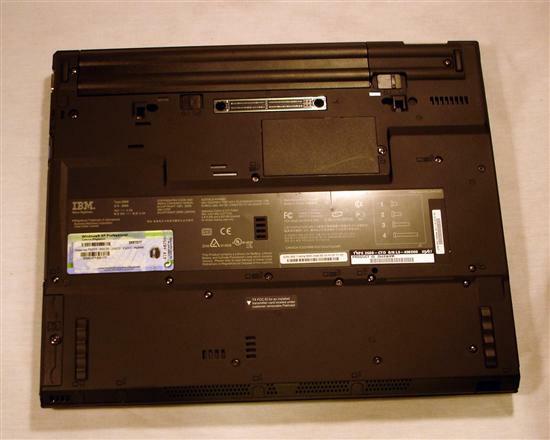 The right side of the notebook has a VGA output (no DVI) and the UltraSlim DVD-RW drive. The optical drive is removable and can be replaced with a a weight saver, second battery or second hard drive. While most people will probably never take advantage of it, this adds a good deal of flexibility for power users. The front of the T43 shows off the infrared port as well as the speaker grills, such that they are. The bottom of the notebook has a connector for the docking station as well as locks for both the battery and a the optical drive. I didn't get a chance to test the docking station. It looks like a good example of one though. It includes all the ports that are on the notebook plus a DVI plug and even a serial port.